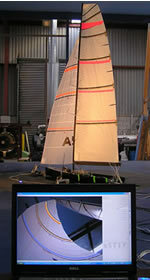 The VSPARS system is an integral part of sail testing at the Twisted Flow Wind Tunnel at the University of Auckland. The cameras are so small that they can be mounted on the model yacht without disturbing the flow. Sail shapes are captured in real time, allowing trim comparisons and full 3D sail model generation at the click of a button. One of the main uses of VSPARS in the wind tunnel is ensuring repeatibility - sail trimmers can quickly get the sails back to a previous run condition, and can explore the trimming space whilst keeping track of the changes they have made relative to a datum. VSPARS is also allowing sail designers to see at a glance the depth of the flying shapes of offwind sails. With 10 minutes and a pair of scissors, a sail can rapidly be reshaped and retested with accuracy. VSPARS exports data in a number of ways allowing interfacing with numerous programs. One method used by Juan Garay for sail and yacht design is to export the full 3D geometry of the captured flying shapes into a CFD program. This allows him to model sails in CFD, including large masthead sails at wide apparent wind angles, that wouldn't have been possible without VSPARS. VSPARS provides the link between the wind tunnel, on the water and CFD development in ways previously not possible, taking the sail and hull development process to another level. Juan Garay, internationally respected sail designer across multiple keelboat and dinghy classes, comments that "VSPARS allows us to capture flying shapes for all sails quickly and efficiently (including MH0's / flying spinnakers) and then directly import them into our CFD software which is revolutionising our design process".